DUMBARTON'S hopes of continuing the fine form they showed on Jim Duffy's debut as manager the previous week were bunkered by Montrose at neat Links Park. DUMBARTON'S hopes of continuing the fine form they showed on Jim Duffy's debut as manager the previous week were bunkered by Montrose at neat Links Park in front of a 549 crowd. They lost 1-0 to their hosts, a result which saw them sink to the bottom of the Ladbrokes League One table. The Gable Endies scored the game's only goal through substitute Graham Webster on 52 minutes. Sons went closest through Iain Russell in the first half, with the striker seeing a narrow angled shot smartly saved. 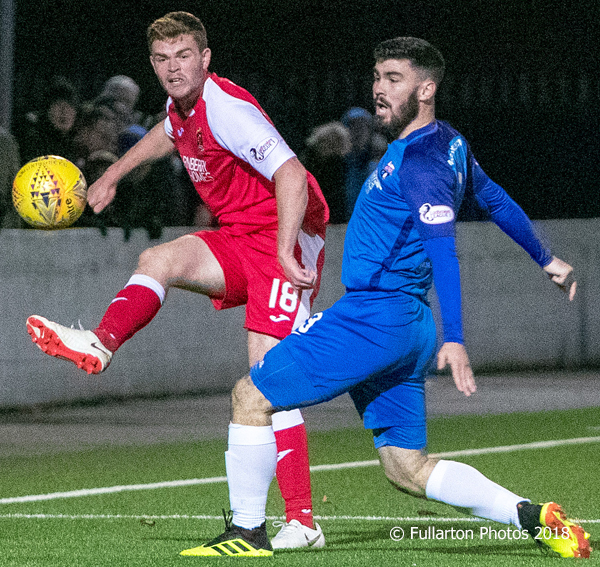 Despite being urged forward by their manager, they were unable to carve out clear chances, and the home defence and excellent goalkeeper Jordan Millar ruled the roost. The picture shows Scott Allardice beating Andrew Steeves to send over a cross.